Treat overworked hands to the Darphin All-Day Hydrating Hand and Nail Cream, a conditioning moisturiser that softens skin and cuticles. 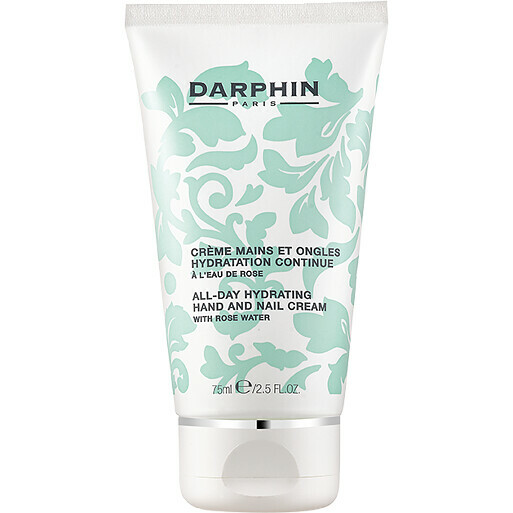 The Darphin All-Day Hydrating Hand and Nail Cream will instantly nourish and pamper all skin types. Formulated with replenishing and restorative botanicals to boost your skin’s ability to retain moisture, this luxurious formula will keep your hands and nails beautifully soft and hydrated. Boasting an 85% natural formula enriched with rose water to soothe and calm the skin, Darphin’s All-Day Hydrating Hand and Nail Cream uses the antioxidant powers of vitamins E and C to protect and defend skin from free radicals. The infusion of gentian extract deeply nourishes and comforts hands at times when they need it most. Apply to hands and nails as often as necessary. WATER\AQUA\EAU, OCTYLDODECYL MYRISTATE, CETYL ALCOHOL, STEARYL ALCOHOL, DIMETHICONE, GLYCERIN, PENTYLENE GLYCOL, CAPRYLIC/CAPRIC TRIGLYCERIDE, GLYCERYL STEARATE, LIMNANTHES ALBA (MEADOWFOAM) SEED OIL, COCO-CAPRYLATE/CAPRATE, ROSA DAMASCENA (ROSE) FLOWER WATER, TRITICUM VULGARE (WHEAT) GERM EXTRACT, GENTIANA LUTEA (GENTIAN) ROOT EXTRACT, HORDEUM VULGARE (BARLEY) EXTRACT\EXTRAIT D'ORGE, SQUALANE, CHOLESTEROL, LINOLEIC ACID, ASTROCARYUM MURUMURU SEED BUTTER, SODIUM HYALURONATE, PEG-100 STEARATE, METHYL GLUCOSE SESQUISTEARATE, CAPRYLYL GLYCOL, MAGNESIUM ASCORBYL PHOSPHATE, ISOHEXADECANE, XANTHAN GUM, POLYSORBATE 80, TOCOPHERYL ACETATE, ACRYLAMIDE/SODIUM ACRYLOYLDIMETHYLTAURATE COPOLYMER, SODIUM HYDROXIDE, HEXYLENE GLYCOL, DISODIUM EDTA, GERANIOL, CITRONELLOL, PHENOXYETHANOL.